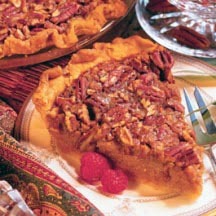 Throw in a twist to your typical desserts this holiday season with a different style of pecan pie! For a healthy approach, try a graham cracker crust. Lay pie crust in a 9-inch pie dish. In a mixing bowl, blend together the yams, 1 egg, brown sugar, cinnamon, and nutmeg. Spread evenly on bottom of pie crust. In a mixing, bowl, beat together the remaining egg, egg whites, corn syrup, sugar, and vanilla until mixture is frothy. Stir in pecans. Carefully spoon over yam layer. Bake for 50 to 60 minutes or until filling is set around edges or until a knife inserted halfway between the center and edge comes out clean. Cool and serve. Nutritional Information Per Serving (1/8 of recipe): CAL 338 (42% from fat); FAT 17g; PROTEIN 3g; CARB 47g; CHOL 32mg; SODIUM 249mg. Recipe and photograph provided courtesy of Louisiana Sweet Potato Commission.